FAAC's new and improved oils are here and have been specially formulated for maximum performance and durability. A few of the improvements include lower volatility, a lower pour point, and a low chemical aggressiveness against rubber components. This part replaces part number FAAC 7140251 Qt+. FAAC's new oils are specially formulated for maximum performance and durability. They have lower volatility, a lower pour point, and a low chemical aggressiveness against rubber components. Included with this new improved oil is a complex additive package, which will give excellent oxidation stability, corrosion resistance, as well as anti-foaming and dewatering properties. All of the many improvements of this new oil give it superior anti-wear properties that will further extend the life of the internal components of our gate openers. This oil has an operating temperature of as low as -40 degrees Fahrenheit. 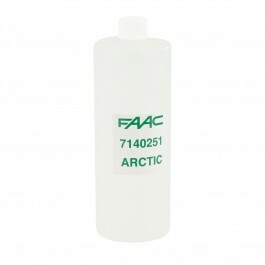 This product is a direct replacement for the FAAC 7140251 Qt+. Not sure which part you need? Check out our FAAC Part Finder.